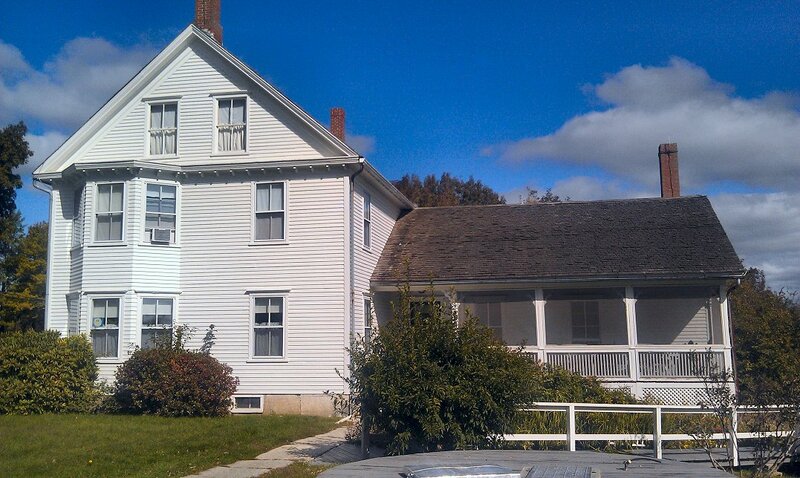 Off Maine Street at the crest of a rolling hill, just northwest of New Gloucester, Maine, one finds a tidy settlement of white clapboard houses nestled around a quiet road. If one had not seen the signs, one would not know that this is the last surviving active settlement of Shakers, which now consists of three members. 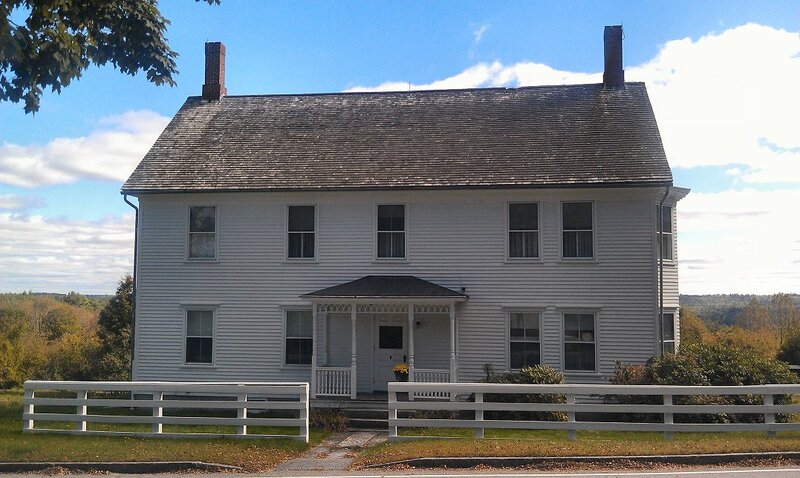 During a recent vacation trip to Maine to visit my wife’s mother and her family there, we spent some time getting to know this peaceful settlement, largely run by a cadre of volunteers known as “Friends of the Shakers,” who help the last members of the order keep their lifestyle going. Map and key of the Shaker settlement, from the historical landmark website. 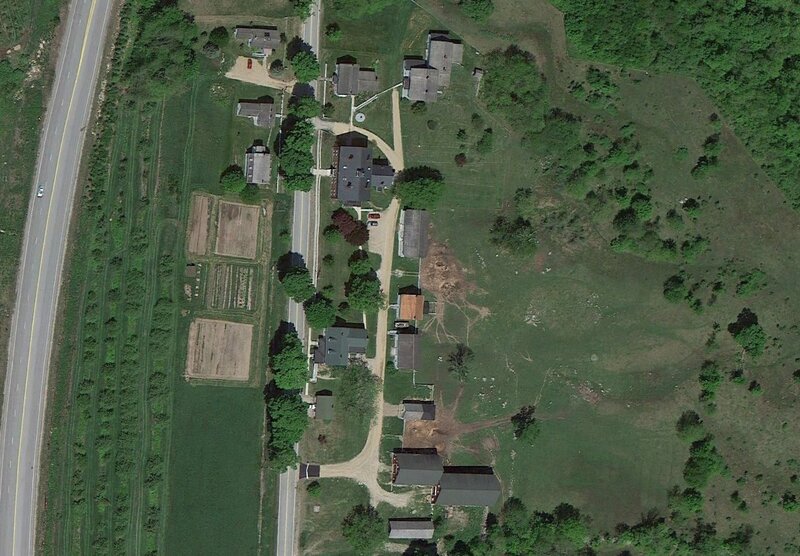 Google Earth capture of the Shaker settlement. 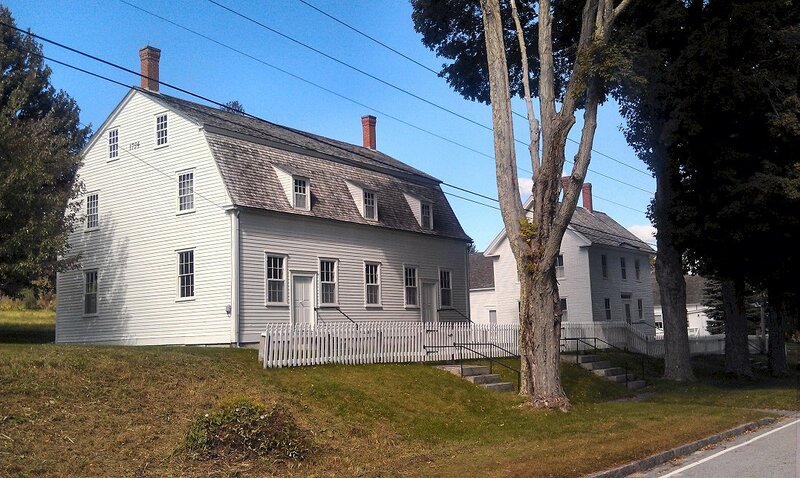 We were taken on an hour-long tour (which seemed all too short, given the amount of things there were to see) by a friendly volunteer; we were able to visit the meetinghouse and the ministry’s shop; had we asked for “Tour B,” we would have seen the Girls’ Shop instead of the ministry’s shop. We’ll have to go back next year and do that one. Sadly, photography inside the buildings was prohibited, because there were 101,000 wonders that I would have loved to record. But it was fascinating to sit in the meetinghouse where men and women would enter by separate doorways, visit the living quarters of the traveling elders and eldresses who formed the upper levels of Shaker leadership, and see a number of places where they worked at creating simple but extremely beautiful (as well as utilitarian) objects for their daily needs. We learned of a number of Shaker inventions, among which were those little wobbly casters that people put under school chairs, knowing that folks like to rock back on them; the Shaker version was made of wood, and I’ll be dipped if I know how it was done. We also saw beautiful examples of their handicraft, including cabinetry, chairs, tables, clothing, boxes, pegs for hanging everything on, as well as the functional architecture of their buildings. The books… oh, the books. I would have paid large money to be able to examine some of the volumes that were displayed in desks and cabinets around the buildings. 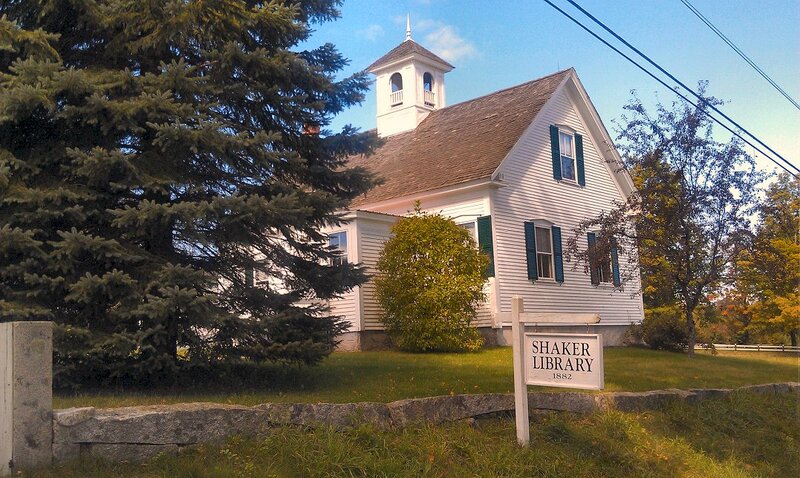 Shaker Library, front view. With an advance appointment, one can visit this building. Next time. The Girls’ Shop, front view. 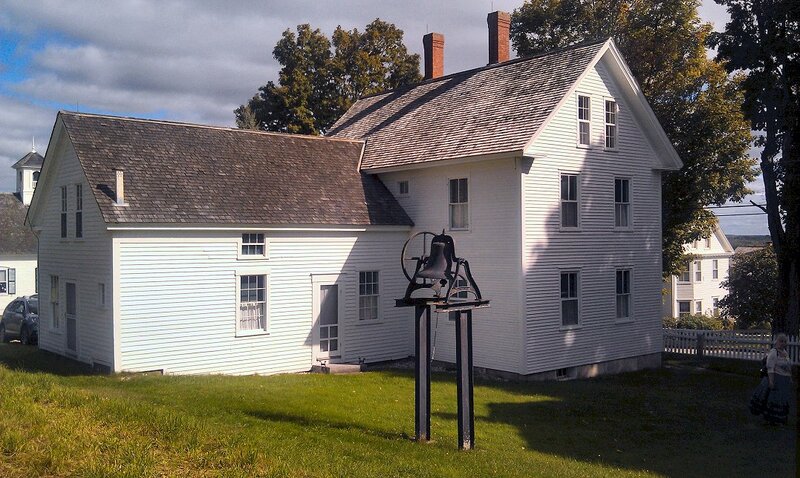 Meetinghouse, built in 1794, and ministry’s workshop. 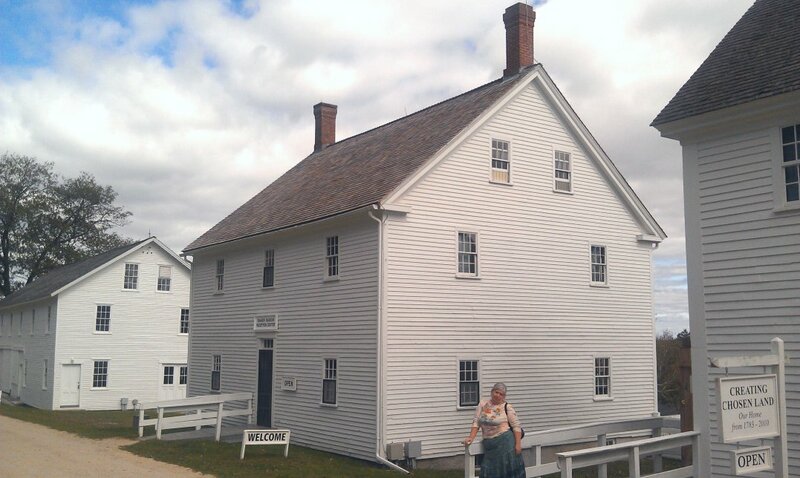 My wife (the Goodwoman of the House) in front of the museum office, which used to be the boys’ shop; exhibit museum on the right, formerly the spinhouse. After the tour and visiting the museum, we spent (too much) time in the Shaker Store (formerly the Trustees’ Office; the trustees were members of the order who dealt with the outside world and were in charge of temporal matters, and often only associated with the rest of the community during worship services.) We bought some lovely yarn (I’m planning a nice fair-isle hat), some herbs, and a few books. 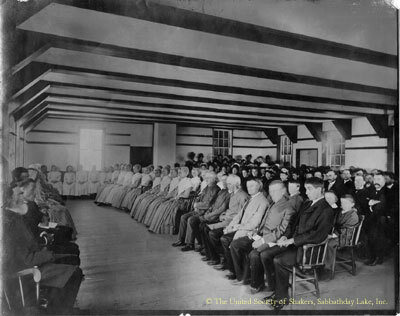 Much can be learned about the Shaker faith and history at their official website; theirs is a story of quiet faith, diligence, and devotion which has weathered many changes in the world around them. Their motto, “Hands to Work and Hearts to God” has essentially defined their way of life, although it is not their devotion to celibacy that has ultimately fueled their decline, but rather the concept of community over individualism. A well-written article in the September 1989 issue of National Geographic entitled “The Shakers’ Brief Eternity” presents a respectful and intimate look at their history and their present. In 1957, after months of prayer, the three Eldresses [of Canterbury] — Gertrude, Emma and Ida — decided to close the covenant to membership. In the past 10 years, three men and a woman in their 20s and 30s have become residents of the community at Sabbath Day Lake, but Eldress Bertha does not recognize them as members. “To become a Shaker you have to sign a legal document taking the necessary vows and that document, the official covenant, is locked up in our safe,” she said. “Membership is closed forever. Canterbury Shakers accept the quiet ending. They believe Shaker values will endure but in different form. Canterbury slowed down decades ago. 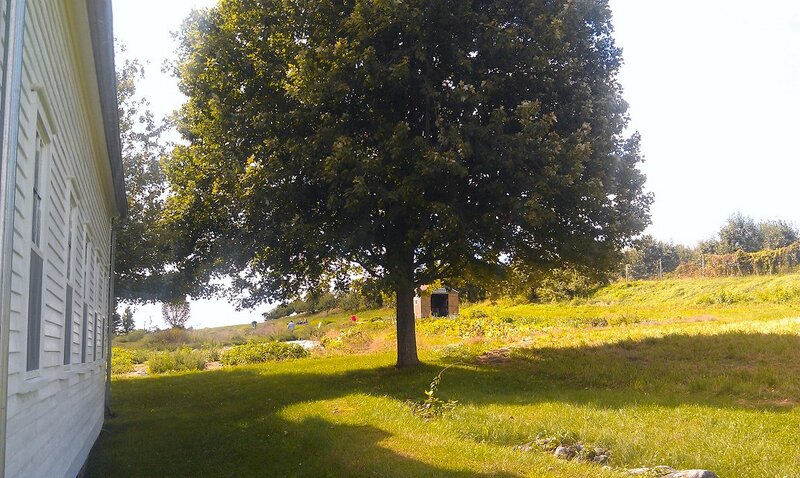 Sabbathday Lake chooses a more energetic path. 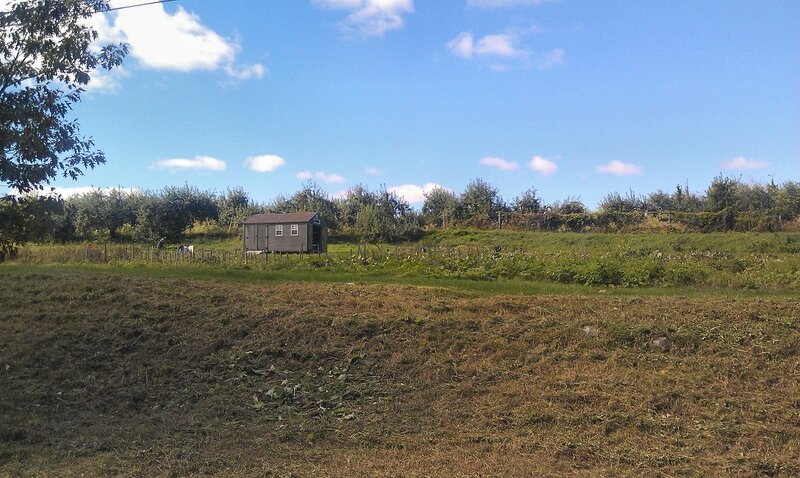 There are sheep to be tended, herbs to be dried, a fence to be mended, meals to prepare. 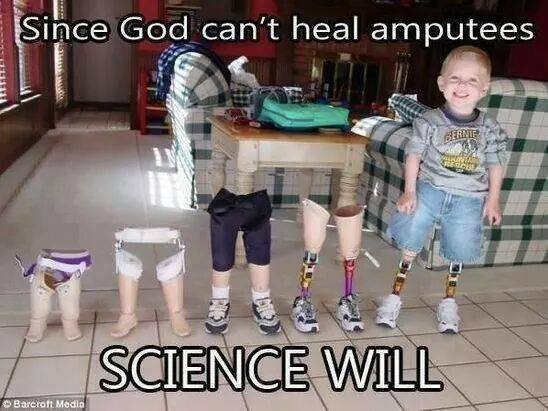 Those seriously interested in the life are sometimes invited to try it. Some stay; some don’t. The territory separating the two villages is a minefield of hard feelings. I had been cautioned not to mention my Canterbury visit to SabbathdayLake and vice versa. I ignored the advice with predictable results. At Canterbury there had been a silence when I mentioned Sabbathday Lake. It was an unpleasantness to be swept under the table. At Sabbathday the rancor is blunt, the hurt palpable. “They say Sabbathday was always the least of Mother Ann’s children in the East,” Sister Mildred observes. While Canterbury functioned, the feelings were hard on both sides. 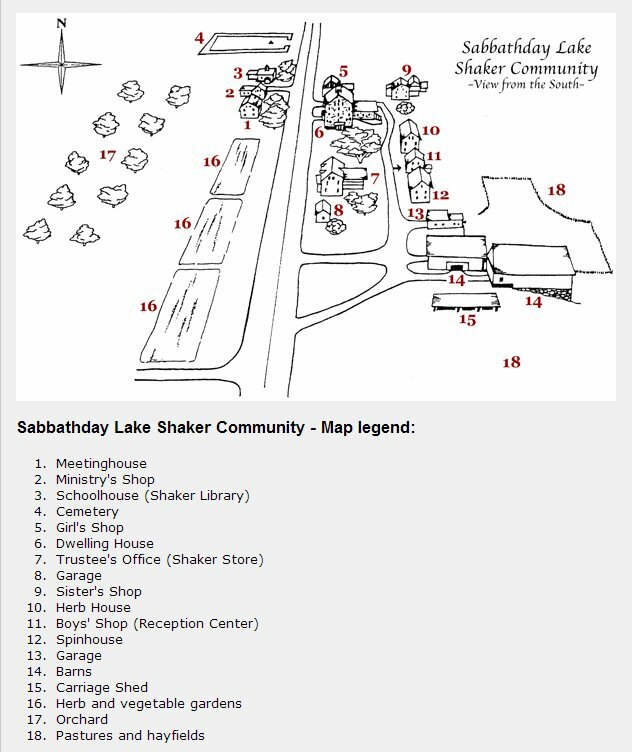 Now that Sabbathday Lake is the last remaining community, memories and feelings may endure, but anyone who will is welcome to explore and embrace Shaker life. According to the tour guides there, the community receives somewhere in the area of two inquiries a week. However, the mean age of the three surviving Shakers is 65, and a fourth member left the community some years ago after he fell in love; the way of the “three C’s” – Celibacy, Community Property, and Charity – is not an easy one to follow. I was delighted to explore the lives and history of these gentle people. I learned that the Shakers invented one of the first perma-press cloths in existence; that their blue wood stain lasts almost forever; that the finials on their chairs are all different, depending on which community made them; that they wove cloth out of fine wood strips to cover their boxes and other artifacts; and that they were skilled in just about every area needed to be self-sufficient. I look forward to my next visit, and hope that I can learn even more about them in the meantime. A view of Shaker Meeting from 1885. A photographer from the Poland Spring Hotel took this image. The Shakers are seated in the front benches. The spectators and guests from the Poland Spring Hotel are in the back rows. The women’s entrance can be seen at the back; the men’s entrance is just outside the right frame of the photo. In earlier days, a stairway existed at each end of the hall leading to separate living quarters for the traveling elders and eldresses of the ministry. 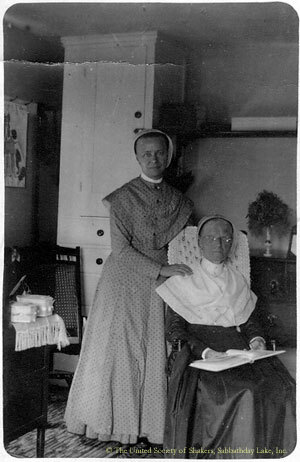 Collection of the United Society of Shakers, Sabbathday Lake, Inc.
Eldress Elizabeth Haskell (left) and Eldress Harriet Goodwin (right) pictured in their fancy goods workroom at the Ministry’s Shop at Sabbathday Lake in 1899. 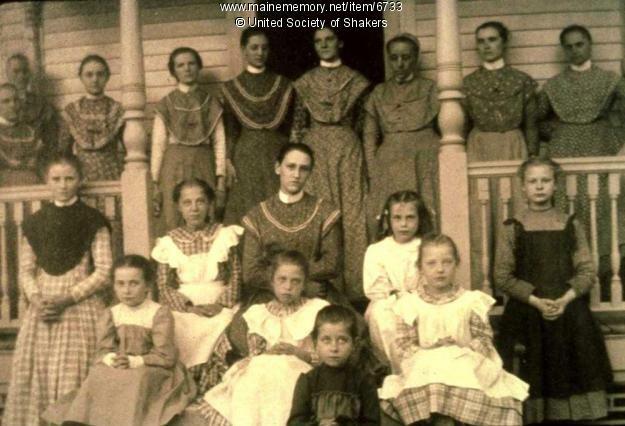 Collection of the United Society of Shakers, Sabbathday Lake, Inc.
Pictured from left are, back row, Sisters Clara Stewart, Amanda Stickney, Mamie Curtis, Katherine McTigue, Lizzie Bailey, Laura Bailey, Sarah Fletcher, Jennie Mathers, Ada Cummngs and Claire Chace. In the front row, from left, are Rosamond Drake, Ethel Corcoran, Grace Freeman, unidentified girl, Irene Corcoran, Iona Sedgley, unidentified girl, Emma Soule and Emma Freeman. Although organized as celibate religious communities, Shakers still made provisions for the raising of children. By this time, most of the children who entered the community were orphans. They were placed in either the Girls’ Shop or Boys’ Shop, apart from the adults in the Dwelling House. Caretakers looked after the children, supervising their education, work and play. The group is on the front porch of the Girls’ Shop, Sabbathday Lake Shaker Village. 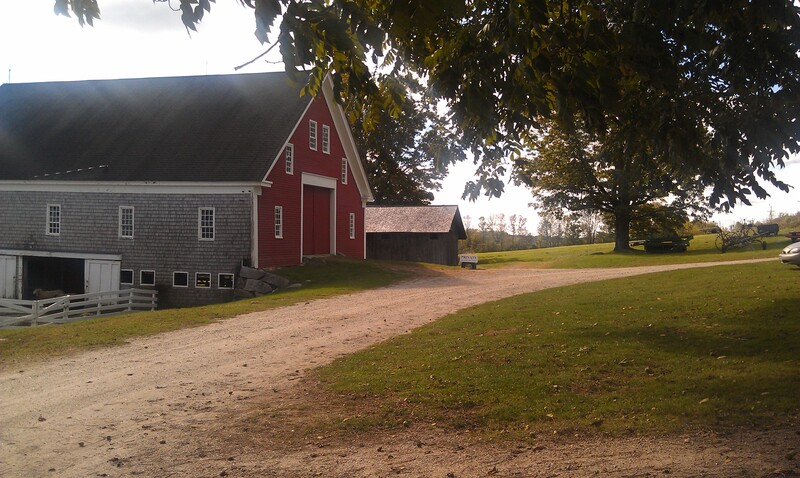 “Simple Gifts” was written by Elder Joseph Brackett while he was at the Shaker community in Alfred, Maine.